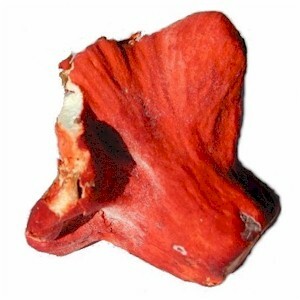 Lobster mushroom is one of Earth's strange and incredible inventions. But don't be scared off by the fact that it's actually not a mushroom, but a parasitic ascomycete (a parasite-fungus that is hosted by, and consumes mushrooms). When this delicious fungal-parasite takes over the mushroom, it engulfs it and turns it red, giving it a lobster-like appearance, and strangely, a subtle seafood taste. Thanks for mycological cannibalism, mamma nature! This dish is like fancy-shmancy fish tacos, but vegan and minus the whole devastation of reefs and other ocean ecosystems. And unlike seafood, this mushroom will still probably be around in 2048. The crisp layering of toasted tortillas, the smoothness of the hearty kale-potato sauce, and the crispy-edged, pan-seared lobster mushroom sauteed with shallots and garlic all come together quite wonderfully. The texture of sauteed and seared lobster mushroom is tender, slightly chewy, and very satisfying. Lobster mushroom isn't cheap, so save it for a special occasion. EMCEE DB: Win a seat at Veggie Conquest, Squash!